The Washington, D.C. Initiative Student Advisory Committee serves the University by working collaboratively to increase Baylor’s presence and impact in our nation’s capital. Comprised exclusively of students with first-hand experience in Washington, the committee discusses ways to help the Baylor community to: obtain strong internships and improve the overall undergraduate internship experience, connect with leaders in a wide range of professional and political arenas, interact with Baylor alumni based in Washington, promote the Baylor’s work in Washington to our on-campus community, recommend dynamic speakers from Washington to come to Waco, and develop concrete opportunities for Baylor Bears to serve the D.C. area. To apply for the 2018-2019 Committee, please review this document and submit all required application materials to Grant Jones at Grant_Jones2@baylor.edu by 11:59PM on Friday, September 7, 2018. 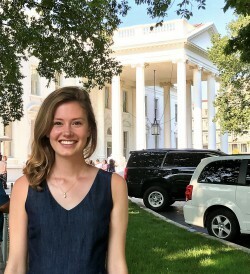 Amye is currently a senior at Baylor University, pursuing majors in Economics and Finance along with minors in Political Science and History as a part of the Baylor Business Fellows Program. She will graduate in May of 2018. 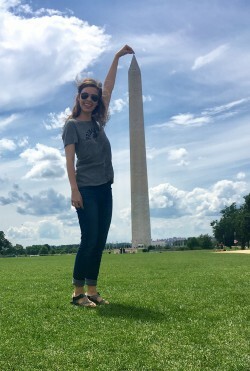 Amye has spent two consecutive summers interning in Washington, D.C., the first as a Mayborn Scholar interning for the Securities and Exchange Commission in 2016 and the second interning for KPMG, LLC’s Advisory branch in 2017. 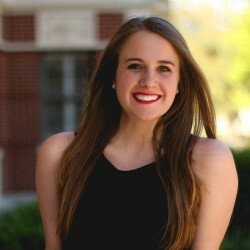 She serves as the Baylor University Student Body President and has been actively involved in Student Government, American Enterprise Institute’s Executive Council, and her sorority Delta Delta Delta since her freshman year. After graduation, she hopes to pursue management consulting in D.C. and eventually earn her MBA. Gracie is currently a junior studying Accounting and Political Science. She is planning to participate in the 5-year accounting Master’s program, ending in December of 2019. Last summer, Gracie served as an intern for Congressman Tom McClintock (CA-04), the Congressman who represents her hometown in California. During her internship, she spent her time answering phones, logging constituent concerns, attending policy briefings, sending out mail, and giving Capitol tours (her favorite). At Baylor, Gracie serves as a Senior Campus Visit Representative. Megan is currently a Junior at Baylor University pursuing majors in Political Science and Communication Studies in Rhetoric and Public Discourse on a Pre-Law track and is in the Baylor Interdisciplinary Core and the Honors Program. Last summer, Megan interned in D.C for Congressman Blaine Leutkemeyer (MO-03) where she addressed concerns of constituents through daily phone communication, drafted correspondence on behalf of the Congressman, attended policy hearings and briefings on the Hill, wrote memos for Congressional staffers, conducted legislative research and gave tours of the Capitol. At Baylor, Megan is involved in Student Government as a Junior Senator, International Justice Mission and Kappa Kappa Gamma. After Baylor, Megan plans to attend law school with the hope of practicing civil litigation in the D.C. area. Taylor is a senior Electrical and Computing Engineering major at Baylor University with minors in Mathematics and Political Science. She plans to graduate in May 2018. 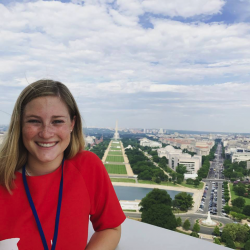 This past summer, Taylor interned in D.C. through a program called Washington Internships for Students of Engineering (WISE) which seeks to engage engineering students in the public policy process through group meetings with agency officials and individual policy research. At Baylor, she is involved with undergraduate engineering research and is a member of Engineers with a Mission. After graduation, Taylor hopes to attend graduate school and to continue pursuing the intersection of engineering with political science and public policy. Secola is a senior International Studies major and Business Administration minor studying in the Baylor Interdisciplinary Core. In Spring 2017 Secola participated in the American University Washington Semester Program, concentrating in Global Economics and Business and completing an internship with Jacobs, Cordova & Associates, a regulatory reform and trade facilitation consulting firm. 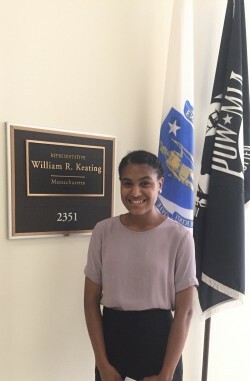 In the Summer of 2017, Secola interned on Capitol Hill in the office of Congressman William R. Keating (MA-09). On campus, Secola is a student delegate for Baylor’s Model Arab League team and is involved in the Baylor chapter of the Sigma Iota Rho International Studies Honor Society. After graduation in May 2018, Secola hopes to work as a project analyst for a multinational company and eventually pursue an MBA or a graduate degree in Economics. Ben is a sophomore University Scholar in the Honors College concentrating in History and International Studies. 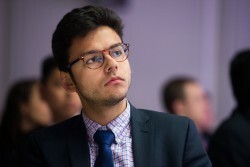 He serves as a Community Leader in Penland Residence Hall and is a student delegate in Model United Nations, where he has attended conferences in Vienna, New York and Austin. He is also a small group leader at Highland Baptist Church. 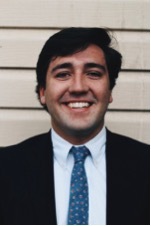 In Washington, D.C., Ben interned on Capitol Hill for U.S. Senator James Lankford of Oklahoma, working on defense, foreign policy and judiciary issues. He has also interned with current EPA Administrator and Former Oklahoma Attorney General Scott Pruitt. After graduation, Ben hopes to attend law school and one day become a Federal Judge. Carter Anne Jones is a member of Baylor University’s Class of 2019. She is currently pursuing an International Studies major with a minor in Russian. 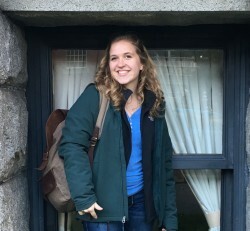 Carter Anne will be studying abroad in Voronezh, Russia, during the 2018 Spring semester. Recently, she completed an internship in Washington, D.C., with Congressman Louie Gohmert (TX-1). 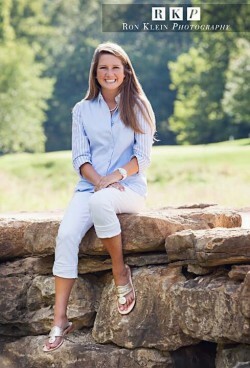 She is an active member of both Chi Omega Sorority and Baylor University Young Life. Carter Anne will be working as an intern for the Department of State with the Embassy of Ottawa during the 2017-2018 school year. After graduation, Carter Anne plans on attending graduate school to further study Foreign Relations. Eventually, she aspires to work with one of the National Security Departments for the United States of America. Blake is a senior Business Fellow studying Finance with a minor in Biochemistry. Growing up in Los Angeles gave him a deep appreciation for popular culture and politics, and this interest continued to grow throughout his high school years. He is currently serving as a Senator in Baylor University’s Student Government and as a member of the Campus Improvements and Affairs committee. 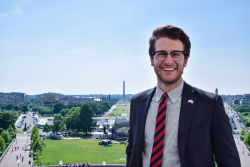 This past summer, Blake attended the American Enterprise Institute's "Values & Capitalism" program where he and a group of students led by Professor John D. Inazu discussed the meaning of a pluralistic society in an increasingly polarized political climate. Blake is also serving on the American Enterprise Institute’s Executive Council this year, and looks forward to creating meaningful discussion around today’s most pressing issues. He will be graduating in May of 2018 and hopes to work at either a think tank or another institution that suits his interests before attending law school. Elliott is a Senior Baylor Business Fellow studying Economics and Political Science with a minor in Mathematics and a Joint Master’s of Science in Economics. He plans to graduate in May 2018. He recently returned from Washington, D.C. where he completed an internship with the United States Attorney’s Office for the District of Columbia. On campus, he is involved in Student Government where he serves as the Chief of Staff to the Student Body President and serves as the Treasurer for the Baylor Undergraduate Mock Trial Team. Additionally, he is a member of the Baylor University Golden Wave Marching Band and has been throughout his time at Baylor. After graduation, he hopes to go to law school and then return to D.C. to work for the Department of Justice. Bennett Shilling is expected to graduate with a Bachelor's in Business Administration with focuses in Marketing and Management in May 2018. He spent this past summer in D.C. working with the largest anti-trafficking organization in the world, International Justice Mission. During his time there, he worked closely with the Brand and Marketing teams to promote brand awareness and bolster ongoing campaigns. Heavily involved in Kappa Omega Tau service fraternity, Bennett is currently serving as Social Chair and organizes events ranging from a Mother's Day to Semi-Formal to weekly tailgates. Bennett hopes to combine his passion for social justice and marketing into the non-profit field after graduation. Courtney Sosnowski is studying Politics, Journalism and Great Texts as a University Scholar major. In the summer of 2017, she interned for the Honorable John Ratcliffe in the U.S. House of Representatives, and gained experience in constituent services and government operations. At Baylor, she is involved as the Panhellenic delegate for Tri Delta, serves as the Social and Service Coordinator for Baylor Panhellenic, and leads a freshman Bible study through Cru ministries. After graduation in spring of 2019, Courtney hopes to return to Washington, D.C. and work on Capitol Hill. 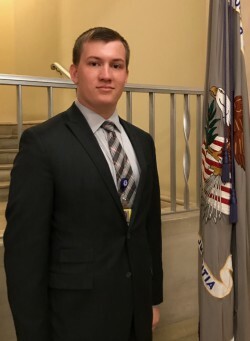 Grant is a member of Baylor University's Class of 2019, currently studying Political Science and History on a Pre-Law track within the Baylor Interdisciplinary Core. From his involvement in Student Government, Kappa Omega Tau, Baylor Ambassadors, and Moot Court, he has discovered a dualistic love for higher education and public service. 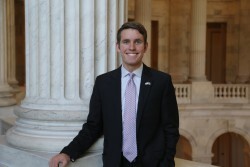 In Washington D.C., Grant has attended the 21st Century Wilberforce Initiative Emerging Leaders Conference, the National Student Leadership Forum (a conference on servant leadership), and has advocated on behalf of Baylor University for affordable education, Title IX concerns, and religious liberty. After graduation, Grant plans on attending graduate school to study Higher Education to eventually serve within Student Life in a university setting.